With the built-in E6-approved reflectors and wide angle optics, the SL600 ensures optimum visibility in the traffic. The wide angle optics cast the light at 180 degrees for maximum spread and even better visibility in the traffic from all angles. The bike light is distinguished by its sleek and minimalist design. The SL600 rear light is mounted to the seat post and is connected to a dynamo on the seat stay. The cable between the bike light and the dynamo can easily be rolled to the right length. The bike light produces its own environmentally friendly induction power by means of a coil in the bike light and magnets on the bicycle spokes - completely without the use of batteries. The bike light is permenantly mounted so you always have it with you. The light is always on whenever you cycle, which makes you extra safe in the traffic - day and night. Magnet-powered bike lights mean no more flat batteries, no forgotten bike lights, no friction when you cycle - just lights which are always on. 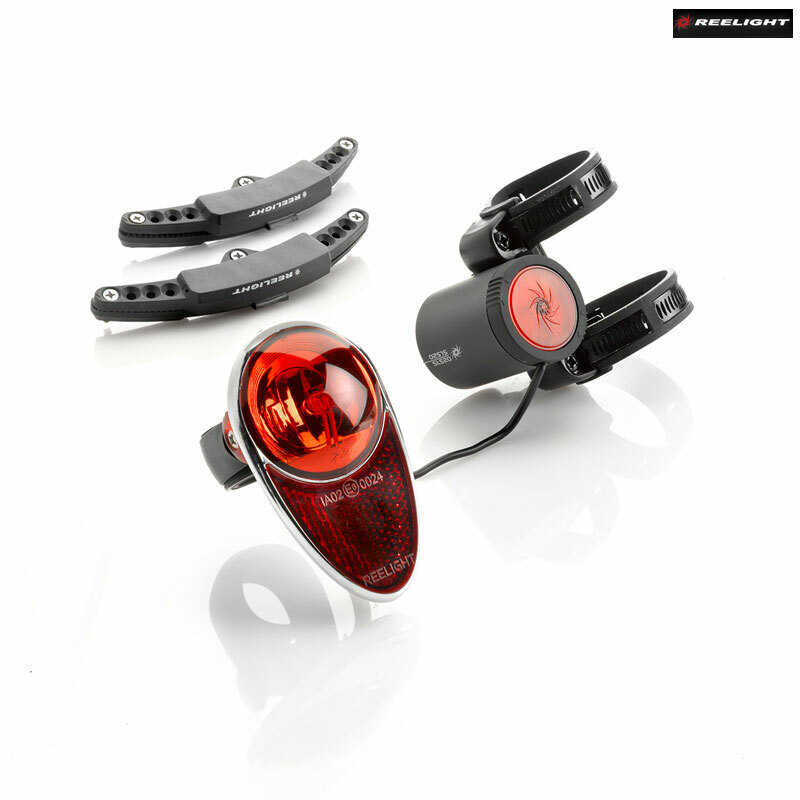 The SL600 rear light can be combined with the front lights from both the SL500 and SL600 series. At this price this is great value for money. I fitted these lights front and back to my nephew's bike. Yes they are fiddly but understandably so. The brackets would not tighten enough to the seat stay close to the dropout but actually the seat stay is a similar distance from the spokes along its length. Therefore, you can have it higher than the illustrations show and you will have plenty of wire length. I used a electric screwdriver and on one of the magnet brackets screwed the head through the bracket: be careful. As long as the brackets hold the magnets and inductor in place permanently this is as brilliant solution for round town bikes and kids bikes, as an after thought. A bit fiddly to set up and I wouldn't recommend for certain bikes with widely spaced rear forks (like on my Marin Muirwoods) which made it almost impossible for the coil to get close enough and parallel to the spoke magnets. The wire to the rear light could also be longer and it is a shame the light stops as soon as the wheel stops. Does It Stay Lit When You Stop, E.G. At A Junction? "The light is always on whenever you cycle"
Is it like the dynamo lights I used to have (20odd years ago) which were brilliant while on the move but went out instantly when you stopped at a junction, or is there some sort of battery so that it stay lit for a short time when stopped? I'm afraid these lights will go out when there is no longer a power input to them.